The report into the 2018 and 2022 World Cup bidding process has been submitted to Fifa by lawyer Michael Garcia. Garcia interviewed more than 75 witnesses and has recommended further action against individuals and made proposals for future bidding processes. The 2018 tournament was awarded by Fifa to Russia in 2010, with the 2022 event handed to Qatar at the same time. German judge Hans-Joachim Eckert leads the adjudicatory chamber that will decide if any wrongdoing was committed. The report is not expected to be made public. Eckert has the power to impose sanctions, although it is not in his authority to take the World Cup away from Qatar or Russia. Fifa president Sepp Blatter has insisted only his ruling executive committee, which chose Russia and Qatar and will sit for its third-quarter meeting on 26 September in Zurich, can change hosting decisions. "The report sets forth detailed factual findings; reaches conclusions concerning further action with respect to certain individuals; identifies issues to be referred to other Fifa committees; and makes recommendations for future bidding processes," said Fifa in a statement. All of those involved in the bidding process for both the 2018 and 2022 events have been under investigation by Garcia. Russia was awarded the 2018 World Cup ahead of Spain-Portugal and Belgium-Netherlands joint bids and England. Qatar overcame competition from Australia, Japan, South Korea and the United States to be named as 2022 hosts. The Qatar 2022 bid committee is facing claims of corruption after the Sunday Times alleged in June that their former Fifa vice-president, Mohamed bin Hammam, paid £3m to football officials around the world in return for support for the Qatari bid. The Qatari bid committee has not commented on the most recent statement from Fifa but, earlier this year, denied all allegations of wrongdoing. Will Qatar paper trail prove corruption? 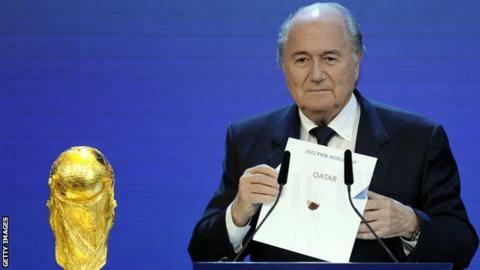 Read more on Qatar World Cup 2022: Will paper trail prove bribery and corruption?